You’ve already heard the jokes about HTC shamelessly ripping off Apple with the design of its newest phone. The truth is, it’s even funnier to hold the new HTC One A9 in one hand and an iPhone 6 in the other. They’re hilariously similar—and that’s not a bad thing at all. There’s more to HTC’s new phone than a laughable tweak to a famous competitor’s design. At first glance, it’s obviously a sleek, reasonably priced new addition to the ever expanding list of Android phones. With a stacked spec sheet and a $400 price tag, the HTC One A9 seems like a pretty fantastic deal after spending a few days with it. Here’s the long and short of it: You could cover up the HTC logo and convince any random person on the street that the new A9 is actually some early version of next year’s iPhone 7. The identical placement of antenna lines are the first giveaway, though HTC actually introduced those lines on the One M7 in 2013, but Apple made it its own with the next year’s iPhone 6. But the wafer-shaped anodized aluminum case with gently rounded edges and a strikingly similar machined speaker grille on the bottom pretty much seals the deal. The A9 just feels like an iteration on the iPhone. I still prefer the look and feel of my old iPhone 6. That said, I couldn’t tell the difference between the two devices when they were in my pocket. With a full 5-inch screen, the A9 is slightly bigger. Only slightly, though. If you fire up the HTC One A9 expecting the same snappiness as the latest and greatest, iPhone or otherwise, you’re going to be a little bit disappointed. Armed with a brand new 1.5-GHz Snapdragon 617 octa-core processor, the A9 should run faster than an iPhone 6 and its 1.4-GHz A8 chip. It seemed a little bit slower for me on processor-heavy applications like my beloved SimCity Build It. Web browsing and email were a breeze, but I’ll need to do more testing to figure out if the speed difference really matters. The other thing I noticed straight away is the screen. The full HD AMOLED display looks strikingly clear, a rare display choice for HTC who usually opts for LCD screens. Running the also all-new Android 6.0 Marshmallow, the flat icons pop nicely and text is razor sharp. But the A9 display also fails the iPhone test as the 6 is just brighter with sharper contrast. Most people don’t look at two smartphone screens at once, so you might be happy with the A9’s admittedly great screen. But it’s no iPhone. Despite those few nit-picky setbacks, the A9 is pleasure to use. The 13-megapixel rear camera includes some optical image stabilization and neat features like a Hyperlapse editing tool that lets you speed up video. The HTC BoomSound promises “better than CD quality” in the headset but sacrifices the usual dual front-facing speaker set up. The new external speaker is fine, but unlike the great speakers on the old HTC One M9, the new bottom-mounted sound machine doesn’t sound nearly as loud or crisp. HTC also says it’s improved battery life so much that you can play 12 hours of HD video on a single charge. Sounds great for binge-watching on the go. On the software side of things, HTC’s also stripping back its Sense UI to be more inline with stock Android. What exactly does that mean? In the near term, less redundant apps, like HTC Music and Google Play Music, and more design choices instep with Android proper. Will you see a dramatic difference on the A9? Not really, unless you really go hunting. HTC’s widgets, themes, and software design language is still all there for the time being, for better or worse. Is the HTC One A9 an iPhone killer? Probably not, but at $400 it’s really not trying to be. 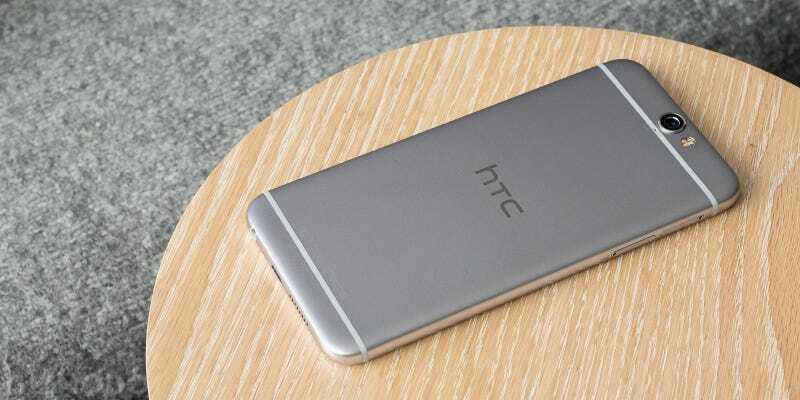 But it could be an HTC One M9 killer, however, given the lower price and sleeker design. Should you buy it? I’m not sure yet. We’ll publish a full review once we’ve had more time to take this gadget through its paces. Do we like it so far? Sure! This is all a roundabout way of saying that the A9 isn’t exactly an Android-powered iPhone. It’s pretty damn close in terms of looks, but you’re definitely going to notice a difference in performance if you’re switching from an iPhone 6 or 6s. But it’s close enough that HTC could lure some users who’ve always wanted Apple design with Android versatility. Price and Availability: $400 unlocked, all major carriers in the first week in November.